US President Donald Trump’s policy of putting economic pressure on Iran to force regime change by inciting a domestic revolt seems to be failing. There is little doubt that renewed sanctions have hurt Iran economically, as witnessed above all by the precipitate fall of the Iranian currency in their wake. However, economic pressure has not led to a revolt against the regime and the currency has stabilised after the initial shock. Indeed, the American action may have consolidated support behind the regime, which can now deflect criticism of its economic performance on to the imposition of American sanctions. In this context, Iran’s relations with Turkey provide a very interesting case study. Both Tehran and Ankara have regional ambitions that have sometimes led to friction between them, as was the case over Syria until recently. However, economic complementarities and congruence of strategic interests have helped to keep their relationship on a relatively even keel. When the Trump administration announced that it was going to reimpose sanctions on Iran, Turkey made it clear that it wouldn’t follow American diktats but would comply only with sanctions imposed by the UN. Economic interdependence provides part of the explanation for the Turkish stand. Bilateral trade between Iran and Turkey isn’t limited to oil and gas. The volume of trade  between the two neighbours stood at US$11.7 billion at the end of 2017, up from US$9.7 billion in 2016, and both countries have committed to eventually raising the level to US$30 billion. However, it’s not just oil and trade that determine Turkish–Iranian relations; there’s also a convergence of political objectives. Turkish and Iranian strategic interests coincide on Kurdish secessionism, which threatens the territorial integrity of both countries. That’s why Iran didn’t oppose Turkish incursions into Syria to prevent the creation of a Kurdish enclave abutting its borders, even when the two countries supported opposite sides during the civil war. Now that Turkey is reconciled to Iran’s ally Bashar al-Assad remaining in power in Syria, the major political disagreement between Ankara and Tehran has lost its importance. Iran’s support to Turkey’s president Recep Tayyip Erdoğan at the time of the failed coup in July 2016 greatly helped in patching up differences. The Iranian foreign minister stayed up all night as the coup was unfolding to monitor the Turkish situation and telephoned his Turkish counterpart five times  to express Iran’s support for the government, thus strengthening personal bonds between the leaders of the two countries. There’s also an increasing conjunction of interests between the two countries vis-à-vis Saudi Arabia. Tehran has been engaged for years in a fierce competition with Riyadh over primacy in the Gulf and over their respective roles in the wider Middle East. Syria had been the primary battleground for their rivalry since 2011. Now that the Syrian civil war is almost over, Yemen has become the major arena of conflict between them. Saudi Arabia and its ally the United Arab Emirates are engaged in open warfare with the Houthis who are in control of the Yemeni capital and are supported by Iran. The Saudi–UAE aerial bombardments have ravaged an already desperately poor country, killing thousands of civilians. An estimated eight million people are on the verge of starvation. Ankara has increasingly come to see Riyadh as its primary antagonist in the competition for influence in the Sunni countries of the Middle East. It finds Tehran a useful ally in tying down Saudi Arabia in the Persian Gulf, thus making it easier for Turkey to emerge as the preeminent Sunni power in the rest of the region. Saudi Arabia’s imposition of an economic blockade on Qatar further strained relations between the two countries. Turkey has a military base in Qatar, which it reinforced following the imposition of the blockade, and the emir sent a contingent of Qatari troops to provide security to the Turkish president at the time of the coup in 2016. Turkey reciprocated in 2017 by flying in essential commodities to Qatar in tandem with Iran in order to render the Saudi blockade redundant. The convergence of interests on Qatar between Tehran and Ankara arises from the primary reason for the Saudi blockade: Qatar’s cordial relations with neighbouring Iran, with which it shares the world’s largest gas field. Jamal Khashoggi’s murder in the Saudi consulate in Istanbul has greatly infuriated the Turkish government, especially the president, who has taken it as a personal insult. Erdoğan has asked for the extradition of Khashoggi’s murderers to Turkey to stand trial and has clearly implicated Saudi crown prince Mohammed bin Salman in the crime, without naming him directly. Turkish–Saudi relations are currently at the lowest point in their history. This has worked to Iran’s advantage and has further cemented relations between Tehran and Ankara. 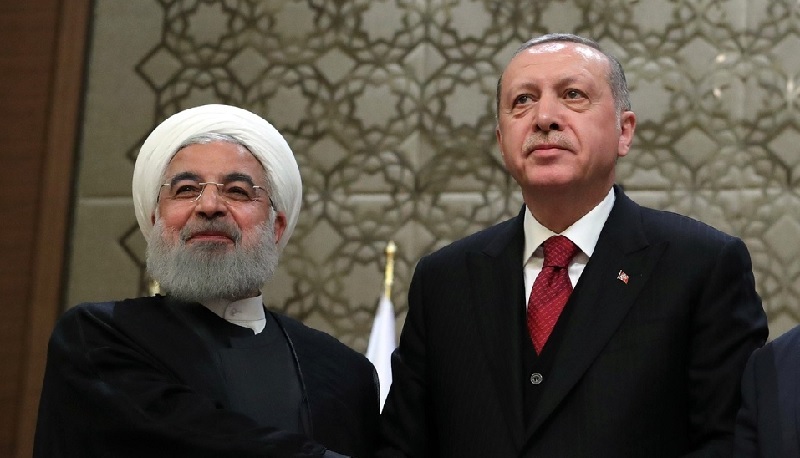 Turkey and Iran are thus moving towards a joint front against Saudi Arabia and its allies, whose numbers are dwindling as the Gulf Cooperation Council unravels. The United States would be wise to take this configuration of forces into account while formulating its future policy on the Middle East. Mohammed Ayoob is a senior fellow at the Center for Global Policy in Washington DC and University Distinguished Professor Emeritus of International Relations at Michigan State University. Edited image courtesy of the President of Russia.